Dexter Daily: The Opening Scene of Episode 7.02 "Sunshine and Frosty Swirl" Was Filmed In Miami? The Opening Scene of Episode 7.02 "Sunshine and Frosty Swirl" Was Filmed In Miami? The answer is NO! The amazing opening scene of the latest episode of Dexter, in which we see Deb and Dexter running down the stairs of his appartment, was filmed in studio. Before season 7 begin production, a film crew was sent to Miami, to capture some fresh views of that apartment exterior and other Miami locations. 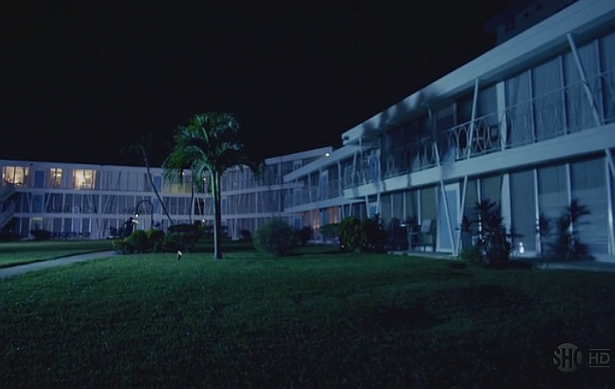 For the next scene, (Dexter confesses to Deb outside on his lawn), they used the front lawn of an apartment near the studio.